This experiment introduces the Analog Discovery's™ Voltmeter instrument. Voltmeters are used to measure voltage differences in a circuit. Since voltages are a difference in electrical potential energy at two different points in a circuit, voltmeters generally have two terminals, or leads. When the leads are connected to two different points in a circuit, the voltmeter displays the voltage difference between the two points. Voltages are often categorized as being either constant or time-varying. 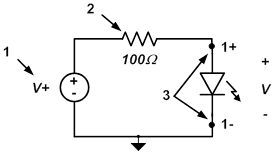 Constant voltages are often referred to as “DC” voltages (DC stands for direct current, but DC has come to be used to describe any signal which doesn't change with time). Time-varying voltages are often called “AC” voltages, where AC stands for alternating current. The Voltmeter instrument on the Analog Discovery can be used for measuring both DC and AC voltages, but we will only be using it to measure DC voltages in this experiment. 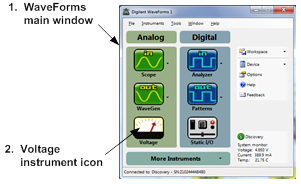 Be able to use the Voltage Instrument on the Analog Discovery to apply ±5V relative to the Analog Discovery's ground. Be able to state how the reference voltage polarity and connection of voltmeter terminals are related to the sign of the measured voltage. Be able to identify the voltmeter instrument terminals on the Analog Discovery and also state the voltage polarity sign convention associated with those terminals. Be able to use the Analog Discovery Voltmeter instrument to measure constant voltages. If you have completed the Voltage Instrument project and your circuit is still intact, feel free to skip ahead to complete Part C of Steps 1 and 2 in this exercise. 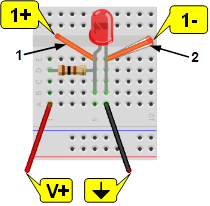 Use V+ to apply 5V voltage across the LED to light it up. 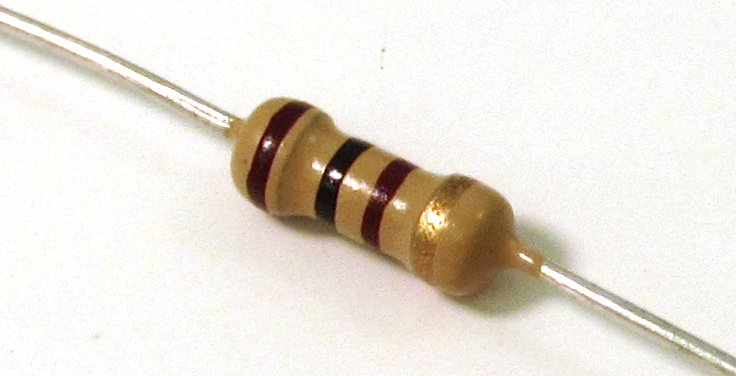 The resistor limits the current. To measure the voltage V, connect 1+ to the LED anode and 1- to the LED cathode. Connect V+ (red wire) to the 100Ω resistor. Connect the 100Ω resistor to the LED anode. Connect ground ( , black wire) to the cathode of the LED. Connect 1+ (orange wire) to the diode's anode. 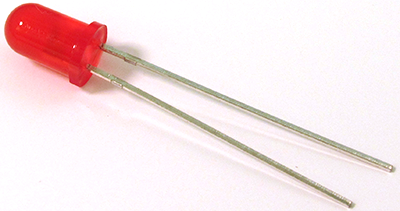 Connect 1- (orange and white striped wire) to the diode's cathode. 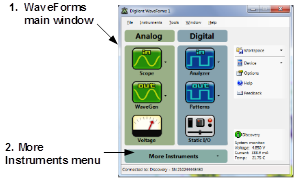 Return to the WaveForms™ main window. Click on the Voltage icon to open the Power Supplies instrument. The LED should light up! Open WaveForms to view main window. Click on the More Instruments dropdown menu to open the Voltmeter instrument. The voltage across the diode will be displayed under “Channel 1”. Try reversing the polarity on your voltage measurement (just interchange the 1+ and 1- terminals). This should just change the sign on the displayed number. 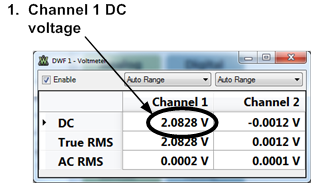 Use channel 2 of the voltmeter (the 2+ and 2- terminals) to measure the voltage across the resistor. Set your polarity such that the assumed positive voltage is at the V+ connection, and the assumed negative voltage is at the diode's anode. Reverse the polarity on the resistor measurement and verify that the sign on the measured voltage changes.